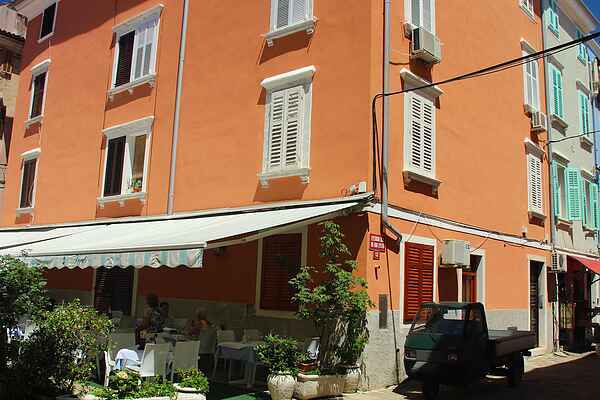 This apartment is located behind Tartini Square in the centre of picturesque Piran! The produce market and the beach are both within walking distance of your holiday home. Start your day with a splendid cup of coffee on one of the terraces, then stroll through the old narrow streets amidst the town walls or walk along the boulevard with its gorgeous view of the town and the sea. In addition to all its cultural attractions, Piran also offers you plenty of delicious food! Enjoy some Mediterranean cuisine at one of the many restaurants. Your apartment has been meticulously decorated and is located on the third floor. You will have access to a living room with a double sofa bed, a kitchen with a dining table, a bedroom, and a bathroom. There is a roof terrace, too, something that is quite common in Piran. It boasts a view of the church and the old town. Piran is in large part only accessible for pedestrians. There is a parking garage close to your holiday home that costs €7.50 per day. From this parking garage you can take a shuttle bus to the Tartini square.